The historical range of art, design and architecture, boosted by advocacy in education of these forces, at Sarah M. Dreller’s Twitter feed piqued my interest. Here, she gives an insightful and in-depth look at her discipline, as it applies to our creative landscapes and built environments—beyond the surface. “To demonstrating how modern art and architecture are relevant to contemporary life.” How do you make this mission statement of yours happen? I do a couple of different things. First, I try to start conversations about art with the question “What do you see?” and I immediately follow up with “Why do you think you saw this first?” or something like that. Then I offer a bit of background about whatever folks say as a way to contextualize their responses to the art overall. This approach reverses the dialogue from the very beginning so that I’m not automatically an authority figure telling people what they should think is important. Instead, I want to help people discover what seems authentic about a given work of art or architecture for their own lives or communities or worldviews—with the hope that their lives will be enriched by that new self-knowledge going forward. I’ve been doing this for 17 years and I’ve found that making the conversation about peoples’ experiences of art nurtures a sense of relevance organically. And it’s much more fun for me! Next, I view my scholarship as a form of participatory citizenship. My projects always revolve around a question that I feel is pretty relevant to contemporary life: How have organizations of authority (governments, corporations, etc.) used art strategically to maintain power? I mean, all thinking people alive today recognize that powerful people are constantly trying to manipulate our perceptions of them and their organizations in order to stay in power. That’s a basic fact of life at this point. I try to push beyond just understanding how politics, money, culture and history get woven together into a particular kind of messaging, though—my hope is that the act of exposing these systems will subvert them. And, finally, over the last year I’ve gotten increasingly interested in digital humanities (DH) as a way to promote a more nuanced appreciation of the human-made world to people outside of academia. I just helped launch a website about political protest graffiti on Chile’s so-called “blackboard of the people” in collaboration with another art historian (Afterimages), and I'm also experimenting with how to present some of my own research using a tool for building interactive timelines that was originally developed for journalists. I also consider my Twitter account to be a version of my digital humanities contribution since I use it to offer some art historical context for what is going on in the world today. My instinct is that DH is relevant largely because it informs and engages people in ways that are less intimidating, structured or authoritarian than academia. 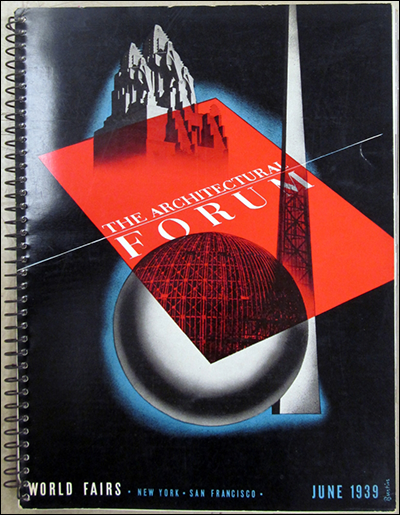 World Fairs special issue of Architectural Forum, June 1939, with original spiral binding. Cover art by Will Burtin. Edited by Howard Myers and published by Time Inc. I’m currently writing a book about Time Inc.’s mid-20th century campaign to popularize modern architecture. My research draws from my PhD dissertation about the history and significance of Architectural Forum, the company’s flagship building industry magazine from 1932 until 1964. How did you get drawn into the worlds of art and architecture history and historic preservation to become a part of it? My parents were both connected to the arts when I was a kid—my dad had a PhD in African-Brazilian literature and my mother was a docent at various museums throughout my childhood. One of her longest-term docenting gigs was with The Dali Museum in St. Petersburg, Florida, so I spent hours (literally) sitting in front of The Hallucinogenic Toreador (Salvador Dalí, 1968–70) in my tween years. We traveled quite a bit too and there used to be stuff they/we collected in our travels all over the house. For instance, something I spent a lot of time studying was the big, detailed print of The Garden of Earthly Delights (Hieronymus Bosch, c. 1480–1505) that I believe my parents purchased during one of their trips to the Prado in Madrid. I realized there was a potential career in something having to do with art history during a trip to Spain when I was 13. My dad and I were at the El Greco Museum in Toledo and someone was purposefully cleaning a painting in the gallery so that visitors could watch the process. It’s cliché to say this, but it really was like a lightning bolt hit me in that moment! The idea that I could actually be around real art all the time and make a living doing it was very appealing. I was pretty focused after that. I started college as a double major in art history and chemistry, in fact, with the intention of getting a PhD in one of those fields and working as a painting conservator. Meanwhile, I had a close friend in high school who was adamant about being an architect. Through all our family travels in the US and abroad, I had had some pretty fantastic personal experiences with great buildings and human-made landscapes, so it wasn’t hard for me to get excited about architecture too. I took drafting in high school and my parents were very supportive of architecture as a possible college major. But when my dad took me to visit the closest architecture school, the dean went out of his way to emphasize how difficult the profession is for women—and, unfortunately, my 17-year-old self let that guy talk me out of the idea of being an architect. To this day, I really don’t know if he was a sexist jerk or a well-meaning educator, but I’m sure I’m not the only woman with a story like this. And I’m not talking about something that happened many generations ago, either! Anyway, in my mid-twenties I did start a professional master’s degree in architecture, but it was pretty clear that I really ought to be involved with understanding and protecting historic buildings rather than creating more new ones. I wasn’t a bad designer, I don’t think, it just turns out that my heart isn’t really connected to expressing myself in that way. And I wasn’t quite ready to give up on some version of art conservation as a career choice, either. Importantly, those few years in architecture school laid the foundation for my understanding of architecture as more than just an art. In particular, I learned how social it is as a practice, and I got some insights into the technological and business aspects too. I can’t imagine being the kind of historian I am today without that experience. I started my MA all over again in an architectural history program with the intention to move into the PhD program immediately after that. I was totally worn out by four years of full-time grad school by the time I was finally done with my master’s, though. So instead of continuing in school, I got a job doing research and writing preservation planning reports for Carey & Co., an architecture firm in San Francisco that specializes in protecting historic buildings. After about three years, my boss took me aside one day and informed me that she eventually planned to offer me partnership. I had only just turned 30 and was so flattered! 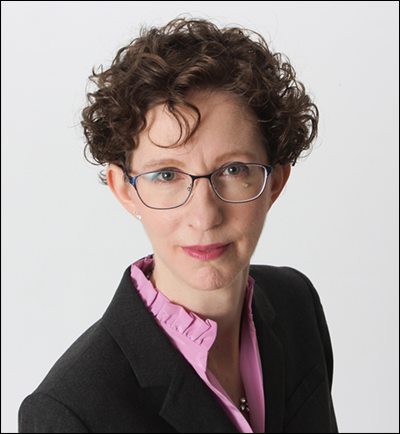 But at the same time, it occurred to me that I probably would never get the PhD I’d been thinking about for so long if I held a really responsible position at a busy firm. So that was the real turning point. I mean, I was pretty good at preservation and I enjoyed it, but I felt like there was something missing. Then I was offered funding at a doctoral program here in Chicago and I decided that was my chance to take my career in a different direction. I still miss actively contributing to the preservation to actual buildings. 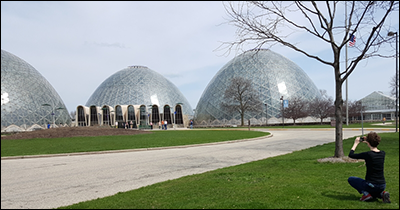 Photographing Mitchell Park Domes, an endangered mid-20th century landmark in Milwaukee, WI. Photograph by Clark C. Christensen. at galleries or museums. How do you make the time to go? I’ve never thought of visiting museums and galleries as something I have to make time for. Experiencing actual art and architecture is part of my job—it’s probably the most important thing I do to remain qualified to talk about art and architecture. It’s also part of who I am as a person. I literally crave direct personal experiences with art. Some mornings, I wake up needing to go for a run, for instance, and other mornings I wake up needing to see some art. Everyone has their “things” that they can’t live without, and this is one of mine. In the United States, I would say the Getty in L.A. and the Smithsonian campus with the National Gallery of Art around the National Mall in D.C. should be bucket list experiences for everyone. These are two places where you completely inhabit the world of art and it inhabits you—it surrounds you, colonizes all your senses, causes you to lose the concept of time and space, exhausts you with the vastness of human creativity while also energizing you with humanity’s potential to transcend. I am really lucky to have visited both the Getty and the Smithsonian many times when I lived in California and Virginia. There are many fine museums and galleries abroad that I could mention here but one of the experiences that really enriched my life was my visit to the Museo Nacional de Antropología (National Museum of Anthropology) in Mexico City. I was especially impressed by the Aztec Sun Stone (early 16th century) which was so much larger and more textured in reality than I had imagined. I went to this museum during the time when I was also visiting a lot of pre-Columbian archeological sites, most of which were still being excavated; perhaps my experience at this particular museum was so meaningful in part because it was so contextualized for me at that moment? Still, everyone I’ve ever talked to about the Museo Nacional de Antropología has agreed that it is a really spectacular place that needs to be experienced in person. These sculptures are power embodied, and you feel that viscerally when you stand in front of them in a way that is simply not possible via photographs. They act on you. And then when you multiply that by the amount and quality of the museum’s holdings as well as the number of different cultures the collection represents—truly, the overall experience is hard to put into words. Or, at least, it is for me. Examples of “Study in the Plastic Use of Paper” student work. My history of modern architecture course, 2013. The “Study in the Plastic Use of Paper” exercise was developed for the Bauhaus Preliminary Course by Josef Albers in 1927. I have used it regularly in my own teaching since 2010 to help architectural history students appreciate the dynamic nature of Bauhaus instruction. I also hope that re-performing Albers’ exercise with students contributes to the Bauhaus legacy's ongoing vitality and resonance. In addition to your teaching, you write, short to long-form, like books. What are your must-dont’s to teach well? What are your must-dont’s to write well? For writing, the worst thing you can do is allow your writing time to become vulnerable to distraction. Writing is a creative act, whether your story is fictional or not, and you must Must MUST protect whatever you need to do it well. Everyone has a different definition of the perfect writing set-up: my two favorites are a quiet room with a view on a stormy day and the middle of the night with good task lighting and a beautiful piece of chocolate cake—but learn whatever it is that makes you most inspired and be absolutely laser-focused on constructing that arrangement as much as possible. 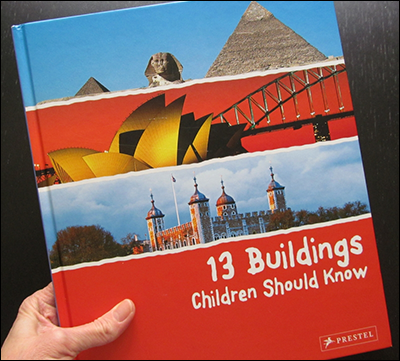 13 Buildings Children Should Know by Annette Roeder, 2009. Part of the 13 Things Children Should Know series published by Prestel. to get familiar with the history of art and architecture? This depends a lot on who the reader is going to be—especially in terms of how much jargon s/he can tolerate and the kind of illustrations s/he will need to get the general idea. As a general rule, though, I usually start by recommending the “13 Things Children Should Know” series. It’s supposedly targeted to kids around 10 years old but it’s actually great for any age! Both of my kids love the book about buildings and my husband (a historic preservation architect) and I enjoy looking it at ourselves. The basic idea is that the authors choose 13 representative paintings, buildings, art techniques, etc., and then dedicate a few pages to explaining and contextualizing each one. These books are thoughtfully illustrated and offer a surprising amount of technical information without going too deep for the average child/person. Choosing only 13 examples of any given medium is extremely limiting, by definition, but on the other hand, I have used this as a talking point. Are there any examples that don’t seem important or representative enough? Is there anything you would have included instead? Etc. What is art? And what is architecture? Art, for me, is any human practice or human-made object that advances consciousness. Architecture is an art medium (both as practice and object) that is concerned primarily with sustaining human existence through the provision of shelter. as a good example—and experience? That’s a hard question since a bunch of artworks come to my mind quickly simultaneously. How about I offer you one example from my own recent experience? Earlier this year, I was at the Museum of Modern Art in New York to see the works from their permanent collection that the curators hung after the president’s January 27th immigrant travel ban. As I was walking through the galleries looking for a specific item I turned around and came face-to-face with Picasso’s Les Demoiselles d’Avignon (1907). Now, I’ve seen this particular painting countless times in person and in books, and I honestly hadn’t even thought about seeing it on this particular visit. But it literally stopped my forward momentum—almost comically so! The bodies are essentially life-sized so there’s no way to avoid the fact that you’re looking at five naked women. But Picasso’s portrayal of the human form is so disjointed, flat and awkward. There’s a real tension in this painting between reality and unreality. And the anxiety of that—never quite having complete faith in your own vision—really resonated with me metaphorically about the point modernity has brought us to today in our country and the world. Trying to negotiate my own anxieties was mostly why I was at MoMA to see those other artworks, in fact. And Picasso painted Les Demoiselles d’Avignon 110 years ago, so in that moment, I also felt like my personal anxiety was connected to five generations of people who have looked at this painting before and felt similar connection to their own lives and zeitgeists. 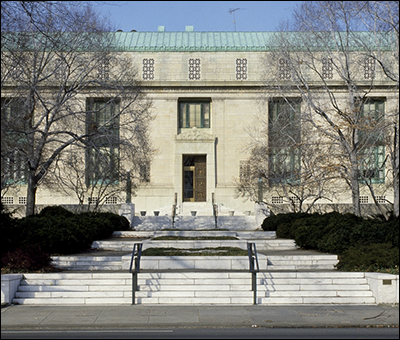 Front entrance, National Academy of Sciences Building, Bertram Goodhue, Washington, DC, 1919–24. Detail of a photograph by Carol M. Highsmith. Highsmith Archive, Library of Congress, Prints and Photographs Division. I wrote my masters thesis about how and why Goodhue strategically referenced ancient Greek and Egyptian scientific heritage in his NAS Building design. 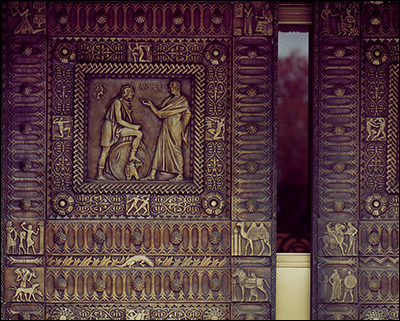 Aristotle bronze door panel by Lee Lawrie, front entrance, NAS Building. Photograph by Carol M. Highsmith. Highsmith Archive, Library of Congress, Prints and Photographs Division. 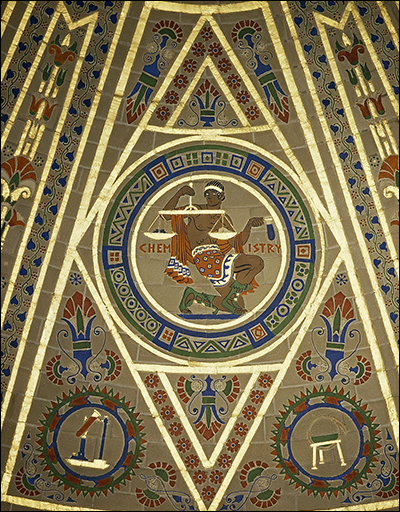 Chemistry medallion designed by Hildreth Meière, Great Hall dome, NAS Building. Photograph by Carol M. Highsmith. Highsmith Archive, Library of Congress, Prints and Photographs Division. I’m the kind of architectural historian that thinks of architecture as a practice as much or possibly even more than as objects (i.e. buildings). So what comes to mind immediately as a good example of a consciousness-advancing experience is shadowing an architect for a day to see what s/he actually does. I can’t tell you the number of times people have wistfully told me they’d choose to be architects if they could get some sort of magical “life do over.” It happens routinely, and while I genuinely think it’s wonderful, I also think it’s based on a very idealized notion of what architectural practice is. I suspect folks would discover that architecture is much more collaborative than they imagine, that there are a lot more different kinds of architects than they realize, and that the pace of architectural creation is startlingly slow. Once you understand all that, you can really start to appreciate what it actually takes to produce a truly transcendent building. Sometimes it boggles my mind that any really great architecture gets made at all! Anyway, shadowing an architect isn’t realistic. So if I had to choose a specific work of architecture I’d say the Alhambra in southern Spain. Again, this is based on my own personal experience, but I think many folks must leave there changed in some way by their visit. What continues to impress me each time I go is the creators’ total commitment to design. Every aspect of the Alhambra as a thing and as an experience received some thought—and I’m not talking about just architectural details although they’re extraordinary everywhere you look. I’m also talking about the smellscapes and soundscapes that were obviously designed (especially the integrated gardens) and the extremely sophisticated sense of procession that produces all sorts of dark-light, warm-cold, small-big sensory juxtapositions that impact your body as you move through the architecture in space-time. I’m not sure I would want to travel back in time to live at the Alhambra long-term since there is also a pervasive implication of control that I would probably have hated after a while. But visiting, for me anyway, was a consciousness-advancing and life-altering experience. In our time, how is art and architecture relevant? The human urge to create is timeless, so in that sense, art and architecture are always relevant. But I also think that this quality is what makes art and architecture particularly relevant today because it gives us touchstones (literally and figuratively) of knowledge and connectivity in an otherwise relatively unknowable and discombobulated world. I’m going to try to explain what I mean without too many philosophical acrobatics! First of all, I don’t agree with a lot of what Karl Marx said, but in 1848, he and Friedrich Engels described modernity in a way that resonated with me when I first read it: “all that is solid melts into air.” (Manifest der Kommunistischen Partei, Chapter 1) In particular, I think they were right about the fact that very little seems fixed anymore, that so much of what used to give life structure is now negotiable and ephemeral. There are days when it seems to me that virtually nothing is solid—it’s all just air that blows in one direction, then the other, then dissipates, then re-forms elsewhere in some other similarly insubstantial fashion, and so on. A surrealist dream-like quality, in other words. And as a former chemistry major, I really like the idea here that solids melt directly into air. That is to say, the pressure of change has become so intense that we’ve skipped the expected progression through the liquid stage altogether. The metaphorical implication is that this sublimation is, in itself, part of the source of our anxiety. Anyone interested in knowing more about all this could take a look at the introduction to Marshall Berman’s book All That is Solid Melts Into Air: The Experience of Modernity, which has been really influential on my thinking on this topic over the years. 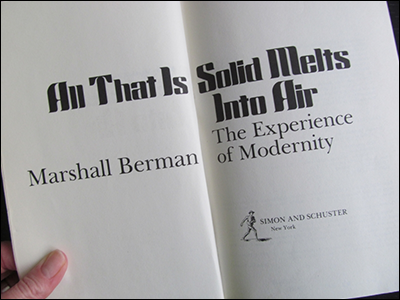 First edition title page of All That Is Solid Melts Into Air: The Experince of Modernity by Marshall Berman. Orginally published in book form by Simon and Schuster in 1982; partly based on articles published in 1974, 1978 and 1981. There was a time in the past when no one would have thought about life this way as a general rule, which means there have obviously been some profound shifts in the assumptions that underlie society’s structure and operations. I see the French Revolution and the late-18th century as the beginning of modernity as we know it today, although some historians would argue with me since we have the Renaissance in the 15th century and World War I in the 20th century as valid starting points for modernity, too. My point, though, is that pre-modern people generally accepted things as they were; the notion that life could be anything other than more-or-less settled didn’t enter into most people’s minds. And now this is simply not the case in much of the world. Many of us assume we have some real power to shape our own destinies. In other words, this notion that nothing is necessarily fixed is a character-defining element of our particular moment in history rather than a fundamental element of human existence overall. I promise I’ll get back to how art and architecture are relevant in a minute, but I want to say one other thing first. Many of modernity’s changes have been really positive, especially political and socio-economic self-determination. It’s just that life is messy! Self-determination is wonderful but it’s also fatiguing to be constantly sifting through information in order to make educated decisions. I would certainly not want to revert to a world in which I had no choice of political leadership and effectively no opportunity to figure out for myself what my social and economic contributions to society would be. But that also doesn’t mean that it’s all puppies and rainbows to be forever responsible for my own destiny in a world that is permanently in flux. 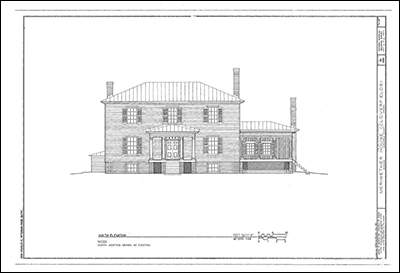 South Elevation, Meriwether House Historic American Buildings Survey, 1997. Measured drawing delineated by me. Library of Congress, Prints & Photographs Division, Survey number: HABS VA-1358. I was a member of the HABS team that documented the home of the Meriwethers, one of Virginia's most historically significant families. The measured drawings in this survey were nominated for a prestigious national award. Architects and historians like me have documented nearly 40,000 historic structures and sites since the beginning of the federal government’s Heritage Documentation Programs in 1933. 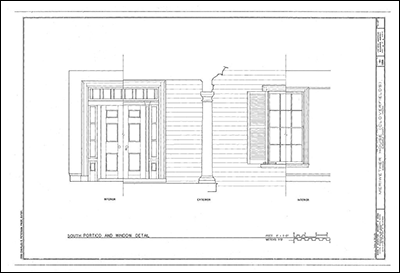 South Portico and Window Detail, Meriwether House Historic American Buildings Survey, 1997. Measured drawing delineated by me. Library of Congress, Prints & Photographs Division, Survey number: HABS VA-1358. And finally I’m back to your original question: how are art and architecture relevant in our time? My answer is this: If you view the human urge to create as timeless and the current sense of being unmoored as specific to our time, then you’ve got an opportunity to combine the two meaningful ways. I’m talking here in particular about things you learn about yourself, your communities or the world when you thoughtfully engage with created objects or practices. As soon as this new self-knowledge inspires empathy for past generations and/or enriches your ability to navigate the present and/or strengthens your ability to move into the future, art is relevant. For consistency’s sake, I’ll also push against the Marx-and-Engels description of modernity—“all that is solid melts into air”—by suggesting that relevant art today is energized air condensed into solids. There is a whole body of thought/work around the notion that art’s role in society is to reveal the invisible forces that impact our ability to shape our own destinies. So I’m aligning myself here with that set of ideas rather than adding anything particularly new. More importantly, though, much of the control these forces have over us comes from their invisibility (they are airy) so when artists expose them (make them solid), their power can diminish significantly. The big question is whether people can understand the physical works of art enough to actually enable real change in their own lives, their communities or the world—that’s what I mean when I talk about advancing consciousness and creating new self-knowledge. Frankly, without that, you’ve just got some nice stuff made by some well-meaning people while racism, sexism, xenophobia, etc., remain as powerful as ever. I have chosen to emphasize architecture since that’s the most solid of all the arts and also typically among the most difficult for people to understand. Anyway, this is turning into a much longer answer than I intended, but I do want to add one quick thought here in closing. Critical thinking and looking are essential to getting any real consciousness-advancing meaning out of art. And critical thinking and looking are also essential to successfully shaping our destinies in today’s changeable world. So engaging with art critically is, in itself, one way to sharpen a very life-relevant skill. This is the part I focus on primarily as an educator, especially in my introductory courses where the vast majority of the undergraduates are not art history majors. In fact, I would venture to say that helping non-majors develop their critical thinking and looking skills is one of the most personally satisfying parts of teaching for me, because it feels like a genuinely relevant contribution to their future lives and to society as a whole. I typically work from home, but I’ve been shifting my workspace around for a while, so it’s hard for me to answer this question in detail. During the years, I was really writing my dissertation, I found a wonderful co-working place exclusively for writers called the Writers WorkSpace. That made a big difference. It’s quiet, thoughtfully planned and decorated, everyone respects each other’s right to protect their “zone” and the owner/manager is a kind, supportive person. I loved being part of that community for the time I needed it. My favorite art historical desk ephemera. 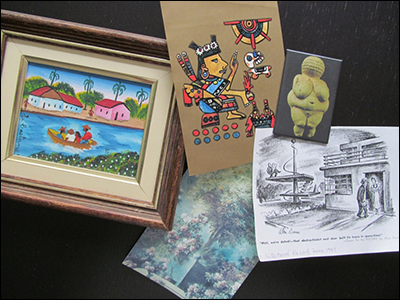 Clockwise from top: Xochiquétzal postcard, Woman of Willendorf magnet, photocopy of Alan Dunn cartoon, The Lover Crowned detail postcard, small Amazonian village scene painting. Something that will definitely be part of my new home “office” is the collection of little art historical items I’ve picked up here and there over the years which really have resonated with me, personally. I can tell you what’s scattered across my desk right now: a magnet with the Woman of Willendorf (24,000–22,000 B.C.E.) that I got at the Naturhistorisches Museum in Vienna; a detail of The Lover Crowned (Jean-Honoré Fragonard, c. 1771–73) that I bought at the Frick in New York; an illustration of Xochiquétzal (Moon Goddess as Priestess) from the Codex Borgia (c. 1400) that I got at the Museo Nacional de Antropología in Mexico City; a small Amazonian village scene painting (signed by L. Caetano) that I bought from a street vendor when I lived in Brazil; and a really clever architecture-themed cartoon by Alan Dunn (Architectural Record, June 1937) that I discovered when I was working on my dissertation. Each one of those has a story behind it, but I really draw a lot of inspiration from looking at all of them as a group simultaneously. Aerial view of the Esplanade of Ministries looking toward the National Congress complex, Lucio Costa and Oscar Niemeyer, Brasilia, 1956–60. Photograph by Mario Roberto Durán Ortiz. 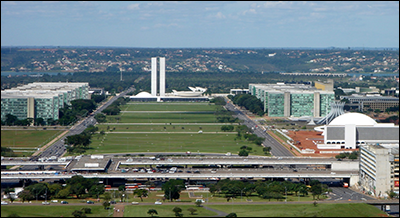 I’m planning a future journal article that will ask how the immense cost of constructing Brasilia impacted public opinion about the city's architectural and societal value. This is an almost impossible question to answer in my capacity as a scholar-historian, because I’m often so mentally focused on past spaces and times that I can’t really engage with Chicago in the here and now. That kind of self-isolation is necessary to this particular vocation, but it’s one of my least favorite aspects of the job. As an art/architectural history educator, Chicago has been absolutely central. There’s so much of the real thing to see in this amazing city, why sit in a classroom looking at slides and listening to me drone on? For my art history courses, the students visit as many museums as I can justify going to and I give them lots of experience-based assignments. For my architectural history classes, at this point I’ve organized those around the idea that we’ll be out in the Loop roughly once a week—assuming I can find someplace to go that is connected to that week’s theme! In a 16-week semester, I usually end up taking students on about 13 “site visits.” It’s physically demanding, for sure, although I adamantly believe the students learn much more than they ever would sitting in at desk in a classroom and I hope they enjoy it more too. The larger point is this: for all my classes my commitment to learning via experiences with actual art/architecture is authentic to who I am as a person. I’d teach like that no matter where I lived, in other words. Chicago’s rich art and architectural legacy allows me to fully explore that side of myself and my career, and for that I’m really grateful. Majority of images courtesy of Sarah M. Dreller.